16 Sep Phone cameras / selfies distort the face making the face and nose look wider and longer. Phone cameras and selfies have became very popular nowadays. However, the phone cameras distort the face and nose making them wider and longer. A number of patients before surgery complain that they do not like their noses in their photos. Also, some patient after rhinoplasty complain that their noses still looks wide or long in the photos taken with phone cameras. 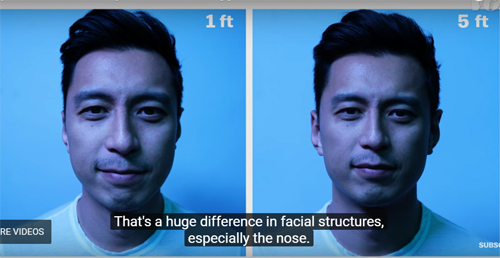 This problem has become so common that some surgeons conducted a study and found that the nose appeared about 30 % wider and the tip of the nose 7 % wider than real life images when photos were taken up close. This study was published in JAMA Facial Plastic Surgery. So, it is very important to understand this distortion and learn how to analyze rhinoplasty results and how to take facial photographs to produce as close to real life images as possible. The lens on phone cameras is too short for facial photography. 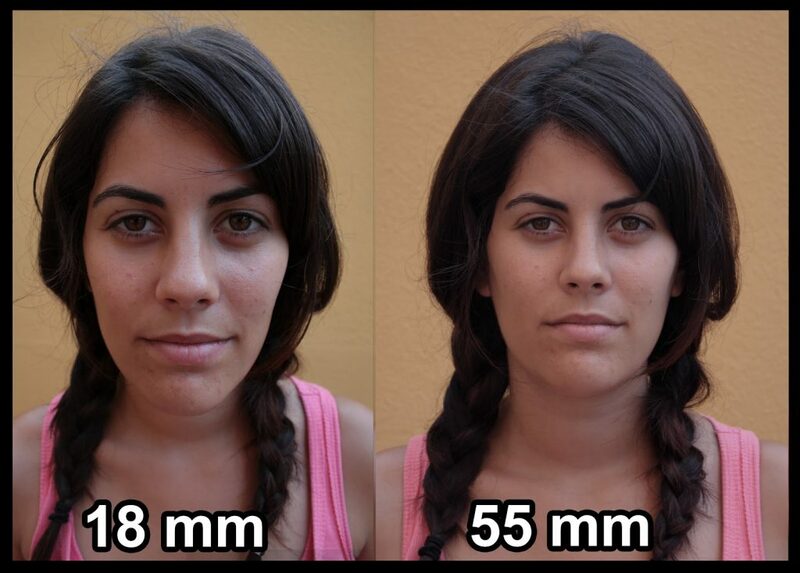 Taking face photos with short lens cameras and up close results in the whole face, nose, and eyes appearing wider and face and nose longer than in real life. 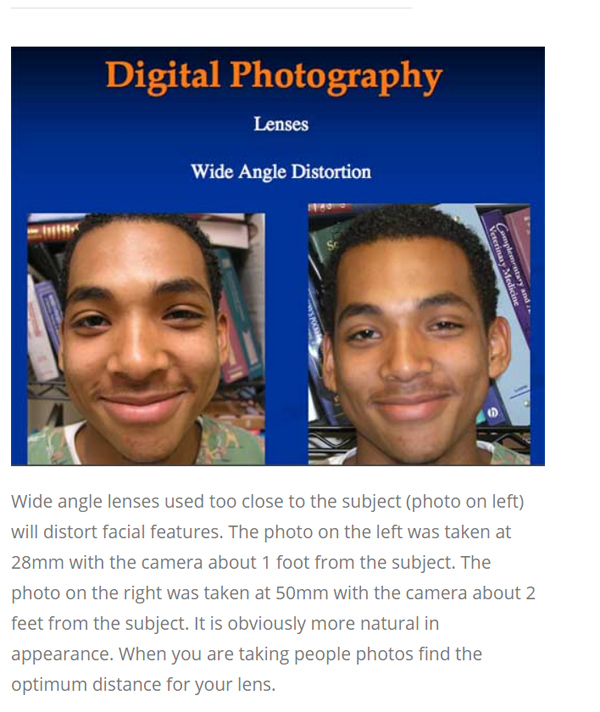 This facial widening distortion also causes the ears to disappear on the photographs. Additionally, any nasal asymmetry maybe exaggerated due to stretching. If you are using a small camera or phone camera, you need to step back 5 feet and zoom in to diminish this stretching effect. However, it is best to use a DSLR camera with a 50mm lens (total focal length of 85mm) to get a real life image (without stretching), which is what is recommended for facial photography and what I use in my office to take before and after photos. If you do not see your ears on your photo as much as you do in real life, then your nose/ face are stretched by the camera. 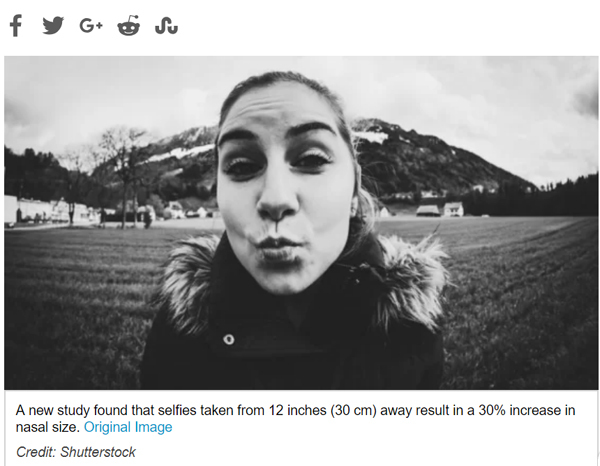 The image on the left (85mm) results in no distortion and ears show. The images on the right taken with a short lens camera up close show the face and nose wider/longer and ears not showing. Photos taken up close. The image on the left is stretched. The nose is wider, face wider, and ears do not show. Short lens camera (18mm) stretched the face and nose making the face/nose appear wider and longer. A photo taken with a 55mm lens produce a real life image without the stretching effect. A selfie that clearly shows a stretched face. The nose and face are wide, the distance between the eyes is wide and ears disappeared. This type of artificial facial and nasal stretching may cause anxiety and sometimes depression in patients undergoing rhinoplasty. So, it is best to take photos using a SLR camera with a 50mm lens. If using a phone camera, have the person taking photos step back 5-6 feet and zoom in to minimize facial stretching. Furthermore, photos should be taken in well illuminated conditions without shadows and without the use of flash. This this an example of a photo taken in my office. Three years after closed rhinoplasty. Nearly all swelling has subsided showing true midnasal narrowing and tip definition. The photo was taken with a Nikon SLR (55mm lens with a total focal length of 85mm). These photos show no facial stretching and ears show as much as in real life. There are no shadows on the face and nose and no flash was used. These images show as close to real life look as possible and these types of images should be used to analyse surgical results. Dr. Vladimir Grigoryants, MD is a board certified plastic surgeon specializing in rhinoplasty. 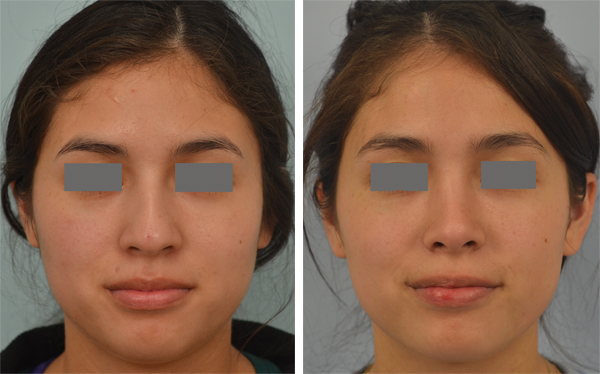 Click on the link to view more rhinoplasty before and after photos .